"In early 2006, I engaged the services of Count On Us PR to assist with press releases and articles, link building and search engine optimization for my website, IRA123.com. Since that time, they have worked diligently to move IRA123 steadily up into high rankings on all the major search engines. 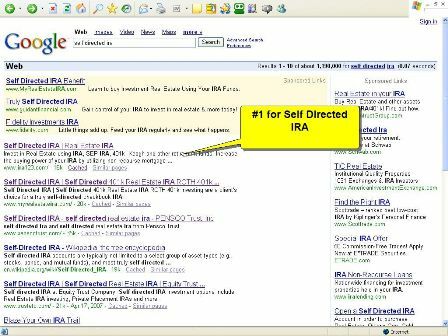 As of January 11, 2007, for the key word search “self directed ira”, IRA123.com is on Page 1 of Google in the #2 position. Yahoo has us on Page 1, position #4 and MSN ranks IRA123.com on Page 1, position #1. Without a doubt, Count On Us PR is completely responsible for these results. Anyone who wants to achieve the same results as IRA123.com should not hesitate to engage Count On Us PR as a consultant. I wholeheartedly recommend them." There are millions of potential clients that search the Internet every day for your products, your services, your information. Are you visible? Search Engine Optimization (SEO) is the process of getting your website to rank high in the search engines. CountOnUsPR.com has a talented staff that will work hard to get you results. Our proof is not in our claim, but in our results. Check out our search engine ranking screen shots. CountOnUsPR.com offers a full line of web design and hosting services. Search Engine friendly website design is one of our top priorites. We want you to have a web presence that people will notice. We also specialize in Video Marketing and Creative Ad Campaigns. We will help create and implement a strategy for expanding your web presence that will increase leads and sales for your business. Our consulting services and unique marketing strategies give you an edge over your competitors. We are happy to provide you with free SEO information and resources that you can use to grow your business. CLICK HERE or fill out the form to the right to access an exclusive free audio on the 15 biggest mistakes that you make. You will be given a download link when this becomes available.